Hotel Aeria is a bungalow hotel located in the southernmost point of the island of Thassos, in an area called “Astris”, the mythical land of the sirens. The hotel is a 1992 building, built in the traditional architectural style that distinguishes the island. Spread over 60.000 sq meters of land, it consists of a central building accommodating the reception, restaurant, bar, swimming pool and a large verandah overlooking the Aegean sea. The guestrooms are spread over 3 secondary buildings, each containing 18 rooms. Special care was taken for all the rooms to have sea-view next to the standard private bathroom, direct dial telephone, piped music, a mini bar, television, air-conditioning and a private balcony. The hotel is operated according to B class standards. The hotel itself is situated 7km from the village of “Potos” and 10km from the small town of “Limenaria”. Both places have souvenir and handicraft shops, restaurants preparing greek dishes as well as an exciting night-life. At a distance of 200m from the hotel there is a small quiet beach. Two more popular beaches are located at a distance o 1km (“Astris”) and 2km (“Psili Ammos”), both of them featuring restaurants and beach bars. They all tempt the visitor for a swim in the refreshing waters of the Aegean while the islet of “Panagia” provides an excellent opportunity for short sea trips by boat. Water sports can be enjoyed at “Psili Ammos” beach as well as renting a boat for fishing. 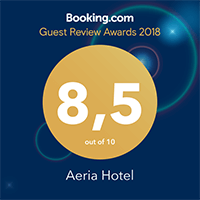 The staff of Hotel Aeria is always at your disposal to make your stay as comfortable as possible. The restaurant of our hotel offers many specialties inspired by the surrounding Aegean Sea. At the bar, you will find refreshing cocktails, cold drinks as well as fruit juices, ice creams and small snacks. The swimming pool area is where everybody meets. Here you and your family can relax in the shade and enjoy its cool and clean water. It will be our pleasure to have you as a guest this summer. Hotel Aeria and the beautiful island of Thassos are waiting to mystify you with their hospitality and beauty… We are expecting you! Each room is tastefully decorated & features a double bed as well a single sofa bed and is able to accommodate up to three people. The room is furnished with a spacious wardrobe, footstools & a dressing table with a large mirror. The room comes equipped with all the modern necessary amenities that will make you enjoy your stay such as Flatscreen TV, Air-condintioning, Mini-bar/Fridge, telephone. The room also features a spacious modern private bathroom equipped with a shower & several complementary toiletries. Finally the room has direct access to a furnished private balcony with a wonderful view.